Chef Michael Schwartz is a big believer in fresh and sustainable cooking using local ingredients. So it's no surprise he's just come out with a book called, "Michael's Genuine Food: Down to Earth Cooking for People Who Love to Eat." Michael is also the chef and owner of Michael's Genuine Food & Drink in Miami and Grand Cayman island. And he's an integral part of the White House's "Chefs Move to Schools" initiative to plant school gardens and teach kids, parents, and cafeteria cooks about fresh food and healthy cooking. All that -- and he accepted the "Chef on a Shoestring" challenge on "The Early Show on Saturday Morning," attempting to make a fresh, three-course meal for four all on our meager $40 budget. On the menu: Roasted "Double Yolk" Eggs with Tomato and Asiago Cheese, Whole Roasted Chicken with Swiss Chard and Caramelized Onion Panade, and Milk Chocolate Cremoso with Espresso Parfait. Oh - one more thing - Michael's chef's hat was automatically tossed into our "How Low Can You Go?" competition, in which the "Shoestring" chef with the lowest ingredients cost will be invited back to whip up the feast for our year-end extravaganza. Incidentally -- YOU can decide what our "Shoestring" chef makes as the main course next week, by voting with your mobile phone. Asiago Cheese: A semifirm Italian cheese with a rich, nutty flavor. It's made from whole or part-skim cow's milk and comes in small wheels with glossy rinds. The yellow interior has many small holes. Young Asiago is used as a table cheese; aged over a year, it becomes hard and suitable for grating. Frisee: A member of the chicory family, frisace has delicately slender, curly leaves that range in color from yellow-white to yellow-green. This feathery vegetable has a mildly bitter flavor and is often used in the special salad mix, mesclun. Choose frisace with crisp leaves and no sign of wilting. Refrigerate in a plastic bag for up to 5 days. Wash just before using. Arugula: Also called rocket, roquette, rugula and rucola, arugula is a bitterish, aromatic salad green with a peppery mustard flavor. Though it has long been extremely popular with Italians, American palates often find its flavor too assertive. Arugula (which resembles radish leaves) can be found in specialty produce markets and in some supermarkets. It's sold in small bunches with roots attached. The leaves should be bright green and fresh looking. Arugula is very perishable and should be tightly wrapped in a plastic bag and refrigerated for no more than 2 days. Its leaves hold a tremendous amount of grit and must be thoroughly washed just before using. Arugula makes a lively addition to salads, soups and sauteed vegetable dishes. It's a rich source of iron as well as vitamins A and C.
Swiss Chard: Also referred to as chard , this member of the beet family is grown for its crinkly green leaves and silvery, celerylike stalks. The variety with dark green leaves and reddish stalks (sometimes referred to as rhubarb chard ) has a stronger flavor than that with lighter leaves and stalks. There's also a ruby chard , which has a bright red stalk and a deep red (tinged with green) leaf. Chard is available year-round but best during the summer. Choose it for its tender greens and crisp stalks. Store, wrapped in a plastic bag, in the refrigerator for up to 3 days. The greens can be prepared like spinach, the stalks like asparagus. Chard, a cruciferous vegetable, is a good source of vitamins A and C, as well as iron. Fontina Cheese: Also called Fontina Val d'Aosta after the Italian valley from which it comes, this is one of Italy's great cheeses. Semifirm yet creamy, fontina is a cow's-milk cheese with about 45 percent milk fat. It has a dark golden brown rind with a pale yellow interior dotted with tiny holes. The mild, nutty flavor, and the fact that it melts easily and smoothly, make fontina perfect for almost any use. Besides Italy, fontinas are made in other countries including Denmark, France and the United States. Many of these fontinas, especially when young, tend to be blander and softer than the Italian original. Are two yolks better than one? You bet! I have a real fondness for double-yolk eggs. In fact, I think every egg should have two yolks-I'm not an egg-white-omelet kind of guy to be sure. Luckily, there's a farmer in my area who farms nothing but fresh double-yolk eggs; it's pretty cool. Now, assuming you might not be able to get these, for ease, I've simply added extra yolks to the recipe. Crack the eggs into a ramekin along with some tomato sauce and cheese, and bake until the egg whites begin to solidify while the cheese turns into a cap of melty goodness. This makes a great start to a hearty meal and can elevate an ordinary steak-and-eggs dish to a special brunch. Make it ahead and pop in the oven when almost ready to serve. Lay the bread slices side by side on a baking sheet, drizzle with the oil, and season generously with salt and pepper. Set aside. Butter the bottom and sides of four 6-ounce ramekins. Divide the tomato sauce among the ramekins, then crack an egg and egg yolk into each. Add a teaspoon of cream to each and season with salt and pepper. Sprinkle with chives and add a layer of cheese to cover the top completely. Put the ramekins on a baking sheet and set on the middle rack of the oven. Put the bread in the oven at the same time. Bake the bread until crisp, about 5 minutes. Bake the eggs until the cheese is melted and the egg whites jiggle a little when you nudge the ramekins, 8 to 10 minutes. To serve, center the ramekins on small plates and lay a crostini on the side of each. Place a small mound of frisace on top of the bread. For Michael's other recipes, go to Page 2. Put the raisins in a small ramekin and pour in the olive oil and 1 tablespoon water. Add the rosemary. Cover with aluminum foil and bake for 30 minutes, or until the raisins are plump. Remove the raisins from the oven and set aside to cool. Crank the oven temperature up to 450°F. Remove the neck and giblets from the cavity and rinse the chicken inside and out under cold water. Pat dry thoroughly with paper towels. Run your finger between the skin and the breast meat of the chicken, and slip the thyme sprigs in there. Season the body and cavity of the chicken generously with salt and pepper. Put a 10-inch ovenproof skillet over medium-high heat and add the canola oil. When the oil is hot, lay the chicken in the pan, breast side down, tucking the wings under. Put the skillet in the oven and roast until the chicken starts to brown, about 35 minutes. Carefully take the pan out of the oven. Insert tongs or a sturdy wooden spoon into the cavity of the chicken and gently lift the chicken out, being careful not to tear the skin. Tilt the chicken slightly so all of the juices from the inside run out into the pan. Set the chicken on a large plate for a minute. Discard all of the pan juices, which will mostly be fat. Nestle the chicken back in the pan, breast side up. Return it to the oven and roast for 30 minutes. The chicken is done when the juices run clear when the meat is pierced with a knife. To be extra sure, pop an instant-read thermometer into the thickest part of the thigh; it should read 165°F. 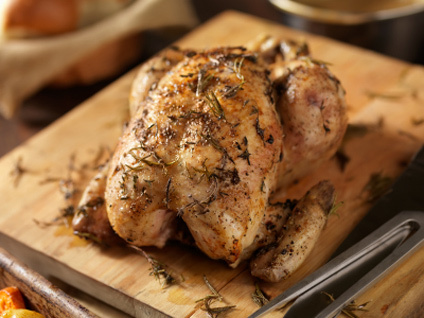 Transfer the chicken to a cutting board and let rest for 5 minutes before carving so the juices can settle back into the meat. To make a quick pan sauce, pour off the excess fat from the pan drippings. Put the skillet over medium-high heat and add the wine. Using a wooden spoon, scrape up the brown bits stuck to bottom of the pan. Season with salt and pepper. To serve, put a bed of arugula on individual plates or on a platter and arrange the carved chicken on top. Scatter the raisins and pine nuts all over. Drizzle with the pan sauce and a little of the raisin oil. Panade sounds kind of "chefy" but in truth, the dish, made from crusty bread and lots of cheese, is just a cross between a savory bread pudding and holiday stuffing. When mixed with eggs and cream, the bread softens so it becomes almost souffle-like, with pillows of puffy goodness infused with chard and caramelized onions. If something can be peasant food and elegant at once, this is it! Pair this as a side with Whole Roasted Chicken with Plumped Raisins, Toasted Pine Nuts, and Arugula or serve it with a simple green salad, and you've got dinner. Put a large pot over high heat and coat with the oil. Add the onion and season with salt and pepper. Cook, stirring with a wooden spoon, until the onion is golden brown and caramelized, about 8 minutes. Add the chard ribs and continue to cook until soft, about 4 minutes. Add the garlic, give it a stir, and cook for a minute until fragrant. Toss in the chard leaves. Turn the leaves over until the chard wilts, releases its moisture, and cooks down, roughly 3 minutes. Season again with salt and pepper. Put the bread cubes in a large bowl and dump the Swiss chard mixture on top. Preheat the oven to 325°F. Butter an 8-by-8-inch baking dish. Also butter the dull side of a piece of foil large enough to cover the dish. Return the pot (no need to clean it) to medium heat and pour in the stock and cream. While they are heating, whisk the egg yolks in a stainless steel bowl until they increase slightly in volume. Gradually whisk the hot stock mixture into the yolks (do not add it too quickly or the eggs will scramble). Pour the mixture over the bread and chard. Add the Fontina, season with salt and pepper, and toss to combine. Pour the bread mixture into the buttered dish and spread evenly. Sprinkle the Parmesan evenly on top. Cover the baking dish tightly with the foil, buttered side down. Fill a roasting pan with 1/2 inch of water. Carefully place the baking dish in the water bath and put in the oven. Bake until the center jiggles slightly when you shake the dish, about 1 hour. Remove the panade from the oven and water bath and remove the foil. Switch the oven to broil. Stick the panade under the broiler for 3 minutes to brown the cheese. To serve, scoop the panade out with a spoon. This decadent milk chocolate cremoso-a silky pudding-like dessert-is drizzled with olive oil for an unexpected pop of flavor. Some people are like, whoa...olive oil and chocolate? But the combo really works. The hazelnuts and chocolate bring forward a Nutella-like flavor and the salt cuts the sweetness. The slight sourness of crisp sourdough bread and smoky flavor of espresso deepen the complexity of the dish. A recipe is only as good as its ingredients, and this is no exception. Use the best-quality chocolate-it makes all the difference between a waxy, vaguely chocolaty flavor and intense chocolatiness. Valrhona, Lindt, and Scharffen Berger are premium chocolates I like. Most of this dessert can be made ahead, so it's perfect to serve for a dinner party. To make the cremoso, put the chocolate in a heatproof bowl. Combine the cream and sugar in a pot over medium heat and bring to a boil. In a large bowl, whisk the egg yolks until slightly thick and yellow. Whisking constantly, slowly add the hot cream to the egg yolks. Do not add it too quickly or the eggs will scramble. Return the eggs to the pot and whisk over medium-low heat until the custard is thick enough to coat the back of a spoon, about 2 minutes; do not boil. Pour the hot cream mixture over the chocolate and whisk thoroughly until the chocolate is melted and smooth. Cover and chill the cremoso until completely firm, at least 6 hours or, even better, overnight. The cremoso can easily be prepared a day or two in advance. To make the parfait, whip the cream with the confectioners' sugar and vanilla to soft peaks. Gently fold in the espresso and spoon into 6 small (3- to 4-ounce) ramekins. Cover with plastic wrap and freeze for at least 1 hour or up to overnight. To serve, set aside about 2 teaspoons hazelnuts for garnish; divide the remainder among 6 dessert plates. Dip a metal tablespoon into hot water for a couple of seconds to heat up. Wipe the spoon dry with a kitchen towel and run the spoon along the cremoso to make a long wave that barrels over itself. Spoon the cremoso on top of the hazelnuts. Drizzle with olive oil and sprinkle with sea salt. Top each serving with a slice of sourdough toast, and set a ramekin of the parfait on the side. Sprinkle with the reserved nuts. So, how did Michael do in our "How Low Can You Go?" contest?